Most of these injuries are preventable and have been caused by improper use of the Quad Bikes [ATV’S]. The most common causes are unsafe speed, drinking and driving, driving on paved roads and into regular traffic, driving in unsafe weather conditions, and driving without proper supervision or training. Suitable head protection must be worn – the helmet is the most important piece of protective gear for safe riding. It should fit snugly and be securely fastened. Eye protection (a visor or safety glasses) should provide protection against flying insects, dust or branches. Sunglasses are not safety goggles and do not provide adequate eye protection. The eye protection should not block the vision of the driver. Protective boots with good grip and ankle support must protect the feet of the driver. Never ride barefooted - leather high –top boots with heels to prevent the feet from slipping of the footrests are recommended. Gloves protect your hands, provide a better grip, and help you control and handle the vehicle. Gloves also prevent fatigue from vibration, scratches from brush, and protection from cold weather. Off-road type gloves, which have padding over the knuckles, offer the most protection. Wear non-snag long pants and long sleeved shirts that will prevent scratches from bushes. The use of high-visibility clothing may also be appropriate. Serious riders should wear off-road racing gear [ ballistic jacket] that has padded areas at the knees, elbows, and shoulders. A chest protector is also advised. Tyres: Always maintain proper pressure in the tyres and ensure that all tyres are inflated to the same pressure. If the pressure in a tire is not the same as the tyre opposite it, the vehicle may be difficult to maneuver. Use a pressure gauge capable of reading low pressures accurately. Also check for wear and visible damage. Wheels: Make sure axle nuts are tight, secured and that none are missing. Riding on rough terrain may cause nuts and bolts to loosen. While the engine is off, check for loose nuts or bolts. Brakes: Check the brake operation – footbrakes and handbrakes. Check the cables and linkages to insure they are moving smoothly. The controls should be positioned so that they are easy to reach and use. Throttle: The throttle should operate smoothly in all steering positions and snap back to the idle position when released. Make sure that turning the handlebars from left to right has no effect on throttle operation. If it does adjustments should be made immediately. Lights and Switches: The ignition switch should be functioning properly before riding. The kill switch should be working properly because it could prevent an accident. Also check the warning lights. All lights must be working when riding at night, but they also make riding during the day safer. Clutch: Check the clutch (if manual), for smooth and positive operation. Oil & Fuel: While the engine is off, check the oil level. An engine cannot operate for long without oil. Always check fuel level before starting a long ride. Make sure that there are no fuel or oil leaks. Chain or drive shaft: Check the chain for proper adjustment and lubrication. Also check for improper wear. If the ATV has a drive shaft instead of a chain make sure it has the correct amount of oil and does not leak. Tool Kit: Make sure the vehicle is equipped with complete tool kit, supplied by the manufacturer. Ride with others – never alone! Know the location details before they are needed in an emergency. Ensure that a designated and responsible person knows the suitable emergency contact procedures. Carry a safety kit that includes flares, a flashlight, compass, blanket, matches and a sounding device. Plan your route to avoid severe slopes and unstable ground conditions. Plan regular routes to avoid rocks, stumps, drainage ditches and steep slopes. Drainage ditches should be piped or bridged on regular routes. Thatch soft spots where necessary. Luminous marker posts may be used on permanent routes to help the operator in poor weather or poor light. Remove the lower branches of trees on regular routes. Never carry a passenger on a single-rider vehicle – this could upset the balance of the vehicle and cause you to lose control. The operator needs the entire seat to safely negotiate rough terrain. Do not drive the quad bike on streets, highways or paved roads or pavements - They are not designed for use on paved surfaces and may be difficult to control. Do not ride at excessive speeds. 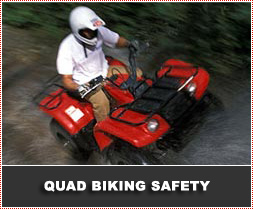 Quad bikes have a short wheelbase and maneuverability, could be very unstable and easily flip on uneven ground. Go at a speed that is proper for the terrain, visibility conditions, and your experience. 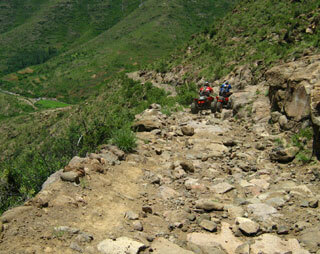 Be especially cautious when approaching hills, turns, and obstacles and when operating on unfamiliar or rough terrain. Keep at least 10 feet between your vehicle and other vehicles – adequate separation will permit safe braking and avoid dust, spray or stones that may be thrown up. Do not attempt wheelies, jumps, or other stunts. Keep your feet on the footrests, riding single at all times. Another major cause of ATV accidents is failure to ride within there skills. Stay away from tough riding areas such as steep inclines and extremely rough terrain, until riding skills have developed. The manufacturer’s recommendations for operation and maintenance must be followed at all times. When braking - begin to slow down early. Look straight ahead when you are stopping in a straight line. Look around the turn as you slow in a curve. Shift to lower gear as you decelerate. When turning - You must be able to coordinate speed and body position to maintain balance while turning. Slow before the turn, and gently increase the throttle as you exit the turn. Support your weight on the outer foot peg, and lean you body into the turn. Do not run the engine for long periods when parked in enclosed spaces. Always park the vehicle in a suitable position with the parking brake applied. Some hills are simply too steep for riding abilities and others are too steep for even an expert’s riding abilities. When climbing hills, approach the hill in low gear with enough speed to reach the top, but not so much to go too fast when reaching the crest. If unfamiliar with the riding area, slow down at the top and turn along the crest of the hill. Keep feet on the footrests and lean forward to keep weight on the front axle. When start losing speed, downshift quickly and smoothly to keep moving without raising the front wheel off the ground. If there is not enough power to continue uphill, stop the vehicle and set the parking brake. If you can, drag the rear of the machine around so that it is heading downhill. Remount and coast to the bottom of the hill using the rear brake to control speed. Do not try to back down or let the vehicle roll backwards downhill. If the ATV starts to roll backwards, apply the front brake. If this does not stop motion, jump free of the machine. 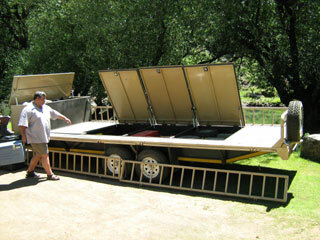 Before loading the quad bike onto a transport trailer, check the trailer load capacity, lights, brakes etc. After loading, ensure the quad bike is securely restrained. Do not rely on the brakes of the quad bike to prevent movement on the trailer.